One Rock Is A Girl’s Best Friend reader will win a pair of tickets to see Fitz and The Tantrums at The Regency Ballroom in San Francisco on Thursday, January 26, 2012. 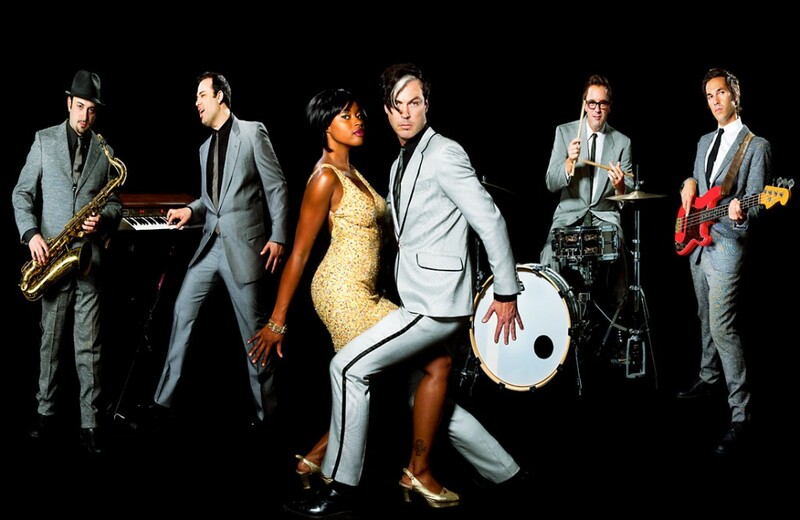 In just a year or so, soulsters Fitz & the Tantrums went from the living room to the main stage. The recipe for meteoric success? Six killer musicians, five dapper suits, irresistible songs, some serendipity and one vintage organ. Since their first show at Hollywood’s Hotel Café in December 2008, Fitz and co. have toured with Maroon 5, played to thousands at Colorado’s world famous Red Rocks Amphitheatre, shared the stage New Year’s Eve with Sharon Jones and the Dap Kings, and performed on KCRW’s esteemed show, Morning Becomes Eclectic, all this on the strength of their stellar five-song EP, Songs for a Breakup, Vol. 1. For some bands, it takes a lifetime to build this success, but few performers deliver an unrestrained blast of soul-clapping, get-down-on-the-floor, moneymaker shakers like Fitz and the Tantrums. Now post-release of their debut full length, Pickin’ Up the Pieces, which has since earned them a 3 ½ star album review in ROLLING STONE, the troupe is poised to get down in dancehalls across the universe. “Sometimes, the Music Gods just give it to you,” Fitz says. The overflow of inspiration startled Fitz. He’d spent years in L.A.’s music industry, writing music and working in a studio with Beck producer, Mickey Petralia. But at those 88 keys, just seven hours after that organ dropped into his life, Fitz had finally found his voice. A huge sound takes a huge studio–Motown had Studio A in Detroit, Philadelphia International had Sigma Studios, Phil Spector’s Wall of Sound was created in Hollywood’s legendary Gold Star Studios– but when it came time to capture the feeling and the soul of soul, Fitz knew of the perfect studio: his home. There in the living room, he recorded Songs for a Breakup, Vol. 1, a burst of effervescent swingers and floor-stompers, infused with the energy of long forgotten songs. The infectious, rolling rhythms of “Breaking the Chains of Love,” immediately turns your head and actually get cemented in your brain, like a good pop song should. The sound is familiar, but distinct. That’s what grabbed the attention of Maroon 5’s Adam Levine. Levine was getting a tattoo in New York when the tattoo artist told him he had to hear this new band he had discovered. After that one encounter, Levine personally invited Fitz and the Tantrums to join their tour. Like the EP, Fitz recorded the full-length debut back at home, to bottle the lightning that struck in those first jam sessions. He now delves into more acerbic lyrical territory, going on the offensive against gold diggers on the exceptionally funky “MoneyGrabber,” and even gets political on the piano-banging, handclap-driven call to action, “Dear Mr. President.” “L.O.V.” is a jaunt through pop music history embarking with a groovy organ intro, meandering through juicy big band breakdowns and Fitz’s svelte croons, then carrying us away with flute outro. It’s a funk-filled plea to give love a chance. These powerful songs take the band’s energy up a notch, but like their energized performances, they never loose control. Those blistering performances are now well-chronicled for adequate ubiquity, Last Call With Carson Daly nailing the money shot for “MoneyGrabber” at the band’s sold out show in November at LA’s El Rey Theatre featuring a sea of a thousand pogoing fans and a handful of F.A.T.T. gems rocked along with blue-eyed soul vet, Daryl Hall on the band’s spot on Live From Daryl’s House. Lest we forget, an omnipresent T-Mobile HTC ad that actually namechecks the band that, for the past several months, is impossible not to see if you’re watching even an hour’s worth of television. Oh, and there are the hot spots on Criminal Minds, Desperate Housewives and a great many more, not to mention a ton of success at radio for the aforementioned runaway “MoneyGrabber,” all with the promise of more to come. There, on the stage, Fitz and the Tantrums are not just a band, they’re an explosion. Scaggs high steps it to the tight-as-hell rhythm section, while Fitz, cooler than cobalt, croons like the aforementioned Mr. Hall for a new generation. It’s obvious that this is no tryst for the band, this is a full-blown, head-over-heels love affair. Well, if you haven’t already done so, ENTER TO WIN TICKETS NOW. For more info about this show or The Regency Ballroom click here. If you have questions or comments, please leave them for me below. This entry was posted in Ticket Giveaways, Tickets and tagged concert, Fitz and The Tantrums, live music, music, Regency Ballroom, ticket giveaway.